Our daily lives are more harried, rushed, and hectic than ever before. While modern life is full of incredible conveniences, we are still trying to fit more tasks and obligations into those same 24 hours in a day we've always had. To combat this incredible crush of responsibilities, we all need to take a break and relax. ​One of the best ways to really rejuvenate yourself is through massage. Instead of sitting in a chair resting your body, massage is providing a healing that wouldn't take place at rest normally. A restful massage can provide a relaxation that relieves stress, which will lower blood pressure. Stress has been known to cause serious health issues from constant migraines to high blood pressure and heart problems. Luxury massage chairs are complicated and beautiful machines that make our modern lives more manageable. They can be customized to give various types of massages based on the style and type including full body, zero gravity, and Shiatsu massage. In zero gravity massage, you will feel as if your body is weightless. They can also be some of the best massagers for back pain. 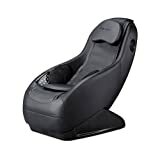 With all the choices available, this review should help you compare all the functions of the top massage chairs along with their features. ​Massage Chairs: How do They Work Exactly? The Inada DreamWave should be called the DreamWeaver since it's a heavenly full body massage chair that hugs the entire body. From the back of the head down to the heels of the feet, the entire chair provides a Shiatsu massage that could put professional massage technicians out of business. The DreamWave is also known as the Japanese massage chair. ​Through tapping and kneading, the chair uses the acupressure technique called Shiatsu to get deep into the muscles and tendons for maximum relief and relaxation. There are choices to be had with the massage chair like the kneading, tapping, rolling back vibration or human hands options. The combinations give the user a truly customized experience. ​The 1,200 square inch coverage of the massage chair includes the arms, shoulders, neck, back, and legs. There is a sensor that will measure the curve of the back to ensure that it's providing the right massage based on the profiles there were installed on the system. There are 106 body profiles in the chair itself. ​As the user, you can choose between 8 programmed sessions including 4 more that are based on the art of Shiatsu; Stretch, Morning and Nighttime, or DreamWave. 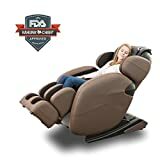 Most customers mentioned the superior experience they had with this massage chair. They also praised the professional service provided with the product. The plastic covers can feel a bit inexpensive. One of the best features of the Human Touch iJoy-2580 is optimal recline feature, which takes pressure off the joints that normally cause the most pain. The recline is initiated with the press of a button that is located within easy reach. The chair will recline from 113 degree to nearly 170 degrees. At this angle, the massage points are their most effective. ​The chair has 3 automatic programs within finger reach while reclining. They are back refresh, neck and shoulder relief and lower back release. There are no programmed intensity levels for the massage chair, but there are pads that can be removed to change the intensity. The chair was named Consumer Digest's Best Buy for 2013 for quality, price and amenities, which includes a cup holder and auxiliary power outlet in the chair to charge devices. While you're being recharged in the chair, so is your phone. The Human Touch iJoy comes in black or espresso to match your décor. It's also lightweight and compact, which makes it convenient for those who don't have a large amount of space on their homes. Customers reported that the chair feels like it's built to last a very long time. The massage was strong and deep between the shoulders and down the spine reported customers. They called it a great design. Customers reported that they use the chair daily to relieve stress. As a chair for sitting, the rollers make it uncomfortable. Some customers believe that the older version was stronger. The Curved Long Rail Shiatsu massage chair has a unique design that will look great in many living rooms. The trouble with most massage chairs is that they have space age looks that make them great for massaging, but not so aesthetically pleasing in a person's living room. The design of the chair will allow it to fit seamlessly into many design decors. The L-design rollers massage the entire body from the neck down to the thighs. There are a few programs to choose from within the chair itself. You can get a deep body Shiatsu massage for your back or entire body. Those options can be chosen separately. You can target particular parts of the body as well. Spot massage can ease pains that you may have from a long day of work. Customers said that the chair is incredibly comfortable. They love that it massages the upper thigh as well as their backs. Customers said they like the design of the chair. Some customers were disappointed that the chair doesn't recline. A few people over 6' 2” didn't find the chair comfortable. ​With 12 auto programs, this chair has any combination of massage that you could possibly want or need. They include Circulation, Smart, Demo, Relax, Healthcare and Therapy. There are 6 massage techniques including Shiatsu, Swedish, Kneading, Rolling, Combo, and Clapping. ​The Osaki provides a complete massage for the entire body. While some of the other massage chairs don't provide much coverage for the calves and feet, that isn't true of this chair. As you sit in the chair, it adjusts to the curve of your body, which results in a more customized massage. This massage chair doesn't forget about your buttocks, upper thighs, lower thighs, calves, or feet where it uses S-shaped system of tracks for a 30 inch roller stroke. ​This new version comes with foot rollers, too. The previous version used airbags for pressure, but in this version, the area was upgraded. This was to provide a deeper foot massage using acupressure for the foot area, which is a feature of reflexology. ​The chair has zero gravity as well as many automatic features for a truly customizable massage based on your aches and pains as well as what kind of relief you're seeking that day. There's also heat therapy for the lower back that intensifies the healing for those with serious back pain. Customers love the quality and design of the Osaki Massage Chair. They had positive comments regarding the heat feature in the chair. Many have reported a deep massage and profound relaxation after use. The remote doesn't have the same features as the main control. Assembling the chair requires help. ​The Kahuna is an exciting example of massage chair technology. It has numerous features and benefits for those who are plagued with body aches and pains as well as stress. First, the Kahuna will scan your body with a computer sensor when sitting in the chair. With this scan, it'll figure out the curve of your body as well as what kind of massage will most benefit your body. ​The chair is zero gravity but it has more than one level of zero gravity. The user can choose the position that will most relieve pain and stress while increasing the benefit of the massage. Zero gravity relieves stress on the joints that have been overused that day, which allows for an increase in the effectiveness of the massage. The functions of the chair include Shiatsu techniques, which apply acupressure to certain areas of the body to achieve a more total body massage. The functions include the use of simulated thumbs, fingers, and palms. It includes kneading, rolling, and tapping techniques, too. ​There's heat for the lumbar region as well as Hula, Yoga, and Tai Chi techniques of stretching that relieve the body of stress. They help to eliminate toxins as well. The dual foot rollers and shoulder air bags provide an overall, total body massage when using the Kahuna. Many customers mention their love for the Yoga stretching feature. The chair is recommended by many chiropractors. Customers remarked on how rejuvenated and refreshed they felt after the massage. Those over 6' 2” didn't find it comfortable. Hard to attach armrests during assembly. The best features of the massage chairs will often depend on the relief that people need. Most can agree that the more customization that is available, the better the relief from pain and stress. The relief that can be experienced from the best massaging chair can help the person feel rejuvenated and ready to tackle whatever the day has to throw at them. The Inada provides a full body massage with sensor scanners that will measure the body and match it to a pre-installed profile. This will provide a customized experience that is best for your body type. The Japanese massage chair cradles the entire body for overall relaxation. With the Yoga, Tai Chi and Hula stretching techniques used by massage therapists, the Kahuna gives the body a stretch that is unique to this specific chair. It massages the body from the back of the neck down to the feet, which feels like a luxurious decadence that can be achieved at home. While they may seem to work like magic fingers, there are either rollers (1) or air bags (2) inside the chair to create pressure on the body that mimics a massage therapist's hands. In some chairs, there could be a combination of both. Air Bag: These massage chairs have air bags that are inflated and deflated to create an enveloping pressure on the body. The intensity of the pressure is controlled by a computer sensor in the chair that will inflate and deflate the bags with different speeds working together to create the massage techniques. Rollers: There are gears, rollers, motors, and vibrating parts in the chair itself that are used to create the techniques used in the chair. The Shiatsu massage would need rollers to mimic the deep tapping or kneading associated with acupressure.What Should You Keep in Mind When Choosing a Massage Chair? ​The expense of these chairs requires that you have the utmost confidence in the company as a whole. That can be based on the type of support they provide as well as the warranties given to the customer after purchasing a chair. They need to stand behind their product. ​The warranty period should be at least 1 year, which is standard for most massage chairs. If you can purchase an extended warranty, that wouldn't be a terrible idea. Keep all the information in a safe place after adding date of purchase to the paperwork. You'll need the receipt from the sale, too. ​Always read through the manual to be sure you understand how the chair works as well as what would void the warranty. There should be a customer service phone number as well as a way to order replacement parts. ​A quality massage chair will allow you to close your eyes and feel as if you're being given a massage by qualified technicians with years of experience under her hands. The chairs with Shiatsu options are based on the Japanese massage technique that has been around for thousands of years. It uses finger pressure on certain parts of the body to automatically relieve tension. Swedish massage doesn't rely on pressure in a certain spot on the body. It's the process of providing kneading motions that glide over long stretches. It's the motion that bakers use when rolling out dough. It's meant to improve the circulation and blood flow through the body especially when heat is added. Chiropractors and doctors might recommend that their patients get a regular massage, and you might be wondering how often you should get a massage. Daily massages will require that you get a massage chair, and in the end, you'll save money by purchasing your own chair versus heading to a massage technician every day. When you understand what you need from the chair, you'll be able to make a better decision about what kind of chair you should buy. Always think about your budget, but keep in mind that if you need a massage daily to function like a human being, you'll be saving money by investing in the best back massager chair. ​Overworked muscles and tendons can often impact the entire body. The entire body is connected with muscles and tissues with each part relying on the nearby muscles and tendons to work correctly. If your thigh muscle hurts, you're likely to feel it radiate to the calf and buttocks as well. ​Ignoring sore muscles will result in tight, cold joints and tendons that can become strained or injured if they're not treated. Athletes understand the risks associated with muscle strain better than most. A massage chair in the home will ensure that overworked muscles never turn into a sports injury due to tight tendons and muscles. ​Sore, tight muscles and tension-filled parts of the body can restrict blood flow. Restricted blood flow can cause serious issues with the heart and other organs. Electronic massage chairs increase blood flow to tight areas, which relieves symptoms of slow blood flow. ​It can also reduce high blood pressure. Stress and the inability to relax can have a detrimental impact on the heart's ability to pump blood effectively. Impaired blood flow, whether it's too high blood pressure or restricted blood flow, will have serious health-related concerns. Massages in general have a bigger impact on health and lowered blood pressure than just relaxing. Biological Research for Nursing reports that only 3 massages every week of only 10 minutes greatly reduced blood pressure (3). ​While massage chairs are excellent for muscle pain relief, they are being used more for relaxation. Tension and migraine afflicted people have more sick days and have a reduced level of life satisfaction than those who have a way to relieve stress. In a study published by the Annals of Behavioral Medicine, participants who were able to get the benefit of massages slept better and had fewer migraines than participants who didn't (4). ​When muscles hurt, the person tends to bend as they walk, or sit slumped in their chairs at work. Muscles that are warm and flexible help to restore good posture, which has an immediate impact on the entire body. Those who slump will also have increased pain and intestinal issues since their organs are compacted, too. Massages are able to return the person to a proper posture with only a few massages each week. ​Along with the muscles that hurt, there can be long-term benefits to the use of a massage chair. The joints will get relief and over time, they will have increased flexibility. Most massage chairs will work on the entire body even when there's certain pain in one area, which has the effect of creating an overall healthier body. There's more to learn on the subject of massage chair benefits. Check out our article "Should I Buy a Massage Chair? Human Massage vs. Massage Chair."